By Azwan Jamaluddin in Culture. Updated on April 6, 2018 . So you have decided to buy yourself a 3D printer after hearing about the amazing things it can build. You want to get started on printing models of your own a custom phone case, cosplay materials, figurines, musical instruments – the possibilities are endless. Hold your horses, there are a few things you need to know before diving into the world of 3D printing. There are a lot of 3D printers on the market today that have varying specifications, which in turn cater to different demands. On top of that, there are technicalities about 3D printing that you really should look into. To help you decide on which printer to make your first, we have complied a list of 10 things you need to know before you buy a 3D printer. FDM is an additive process, where a model is created by heating and extruding plastic, pieced together layer by layer. Most of the 3D printers referred in this post works on FDM, as they are more widely available and easy to find. 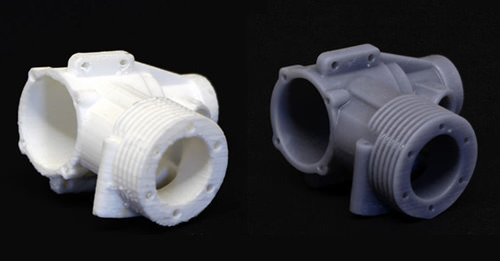 There are 2 other types of 3D printing available: Stereolithography and Selective Laser Sintering (SLS). They are much more expensive compared to FDM. Stereolithography also uses the additive process but instead of extruding plastics, the process utilizes an ultraviolet light beam to harden a model from a pool of photosensitive liquid. This allows for a higher quality printout. 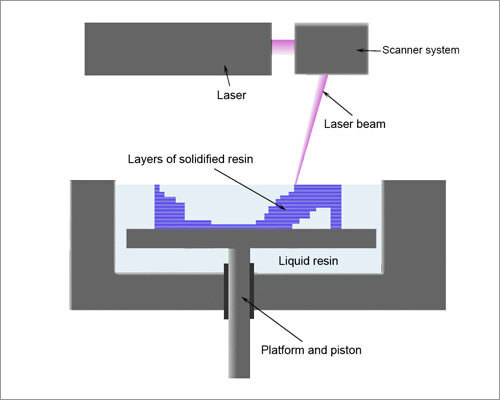 SLS is similar to stereolithography, except that the process involves lasers and powders instead of UV light beams and liquid. 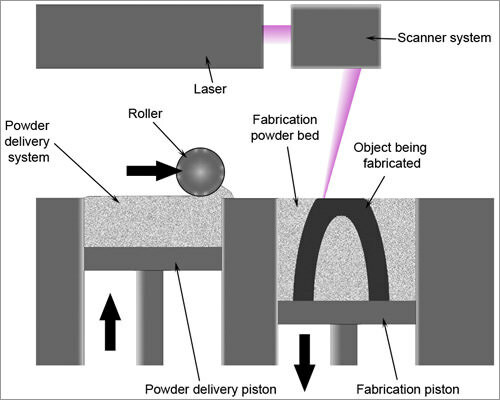 A laser is used to melt the powder, creating a layer of the printed material. This allows some models to print metal objects, which is not possible in the other two processes. 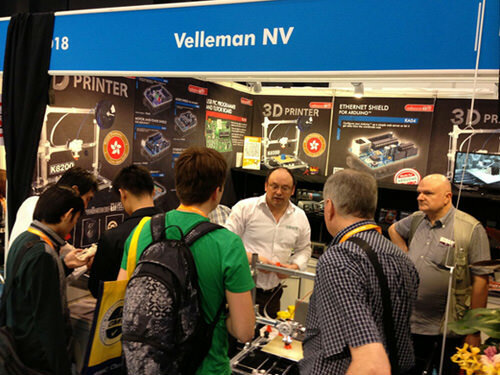 The 3D printing community is one made of creators and makers, so it makes sense that many people would like to try their hand in building a 3D printer on their own. There are building instructions and 3D printer kits available online if you decide to go with this route. 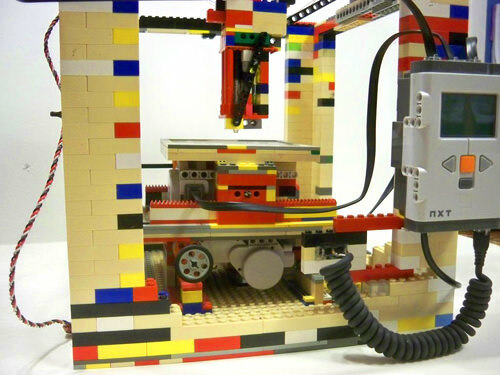 Building your own printer can be cheaper than buying one but if you don’t have the time, you could always buy a pre-assembled printer. Your final decision will depend on whether you are interested in tinkering with the technology, or just want to start printing right away. 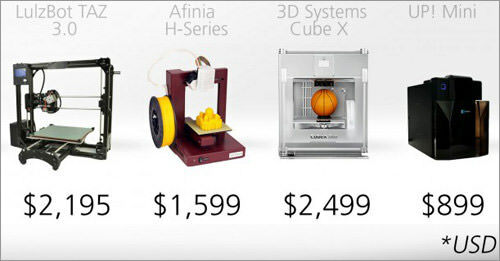 One of the main factors that can help turn 3D printers mainstream is their market price. Prices depend mainly on the quality of the output. In general, the higher-quality ones tend to go above $1000; professional printers can even go above $2000, e.g. the MakerBot series. But if you are just dipping your toes in 3D printing, you can start with simple models that go for as low as $100. With rising popularity and heavy competition, the prices of printers will only go down while the quality improves. Note that these printers do not come with the materials you require to print your products. You will need to separately acquire the materials as different products may require different materials. 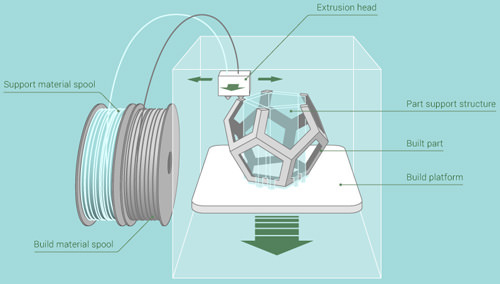 The two materials required for 3D printing are Poly Lactic Acid (PLA) and Acrylonitrile Butadiene Styrene (ABS). Both are thermoplastics that will become soft and malleable when heated, frozen when cooled. 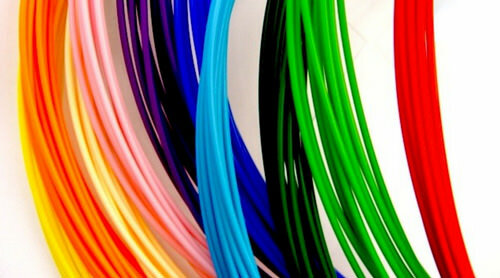 They are sold as 1kg (2.2lbs) spools of filament, priced in the $30 range. Let’s take a look at the good and bad of both materials. 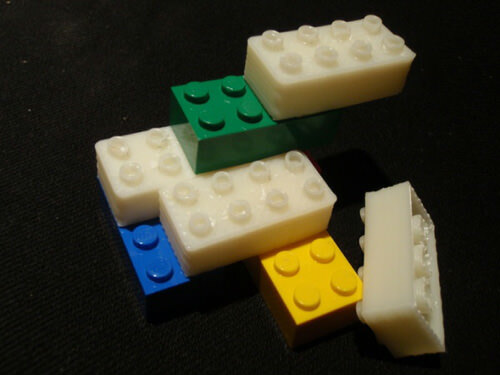 ABS is a petroleum-based plastic that is a popular choice because of its strength and flexibility – think Lego bricks (which can be made using 3D printers, if you didn’t know). Its flexibility makes creating interlocking pieces easier to create and work with. It also has a higher melting point, so your creations will be less likely to deform under high heat. Disadvantage: It takes longer to cool compared to PLA; models are susceptible to warping. Disadvantage: It emits fumes during printing (more on this below). You need to know which material is suitable for your final product. From there you can choose which type of printer you should buy. It is important to know that not all printers can accept both materials – some will work with only either one type. When it comes to filament size – 1.75mm or 3mm in diameter – it doesn’t factor much into the end quality. More popular printer brands go with 1.75mm so it is recommended that you start with that. When it comes to 3D printing, there are a few safety issues to take note. The most important thing to remember is that you are working with heated plastics. Extruders, plastics and in some printers, the print bed itself can get very hot and can cause bad burns if you are not careful. Some printers have no enclosure around the print area; practice extra caution with these printers. 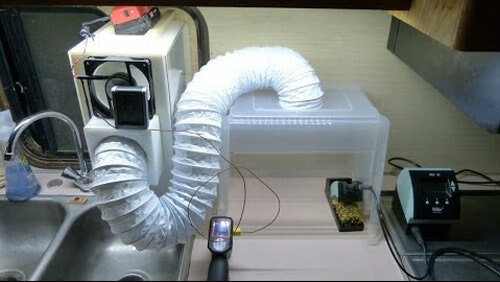 It is important to keep your 3D printer in an well-ventilated room. During the printing process, expect fumes to be emitted, particularly when you use ABS plastics. These fumes are reported to be rather overwhelming although there is little to no research that states the impact they have on general health. Still, it is best to take the necessary precautions, particularly if you will be using 3D printers a lot. 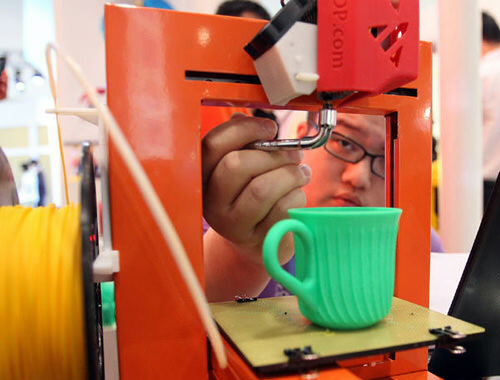 3D printers can be use to create many types of household items, including kitchenware. Both ABS and PLA are generally food safe but if there are additives added in, those additives may not be. Another major concern is that products created with FDM-type 3D printers have porous surfaces on which bacteria can collect in. You can coat the object to make it safer to use but it is best to limit the usage of 3D printed kitchenware. To produce high quality 3D printed products, you need to take note of two things: print resolution and print speed. Print resolution refers to the level of detail the printer can get, measured in microns – the smaller it is, the higher level of detail in the objects you can create. Print speed measures how fast the printer can move its extruder – the higher the print speed, the faster it will print. Note that other features may affect the print speed, such as the acceleration and deceleration of the printer, which helps prevent the printer from shaking. In the end though, the best way to gauge the quality of a printer is to look at its output. You can look at photos, available online, of the final output of 3D printers before buying. When it comes to getting a 3D model, there are two routes: you can create it yourself or download a pre-made model blueprint from the Internet. 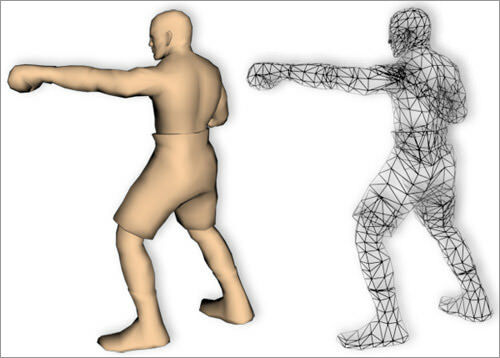 If you intend to create your own model, there are a variety of software, both free and commercial, that will help you bring your creation into the real world. If you like, you can even learn 3D modeling. Learning to model in a computer is a difficult task that will take time and effort to truly get used to. 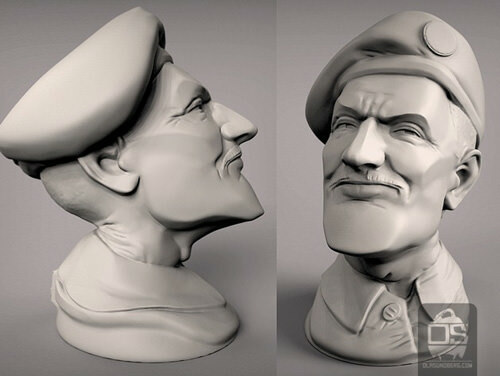 Fortunately, for those who are short on time, there are websites that provide 3D models of many different items, made by enthusiasts from all over. A quick google search can probably yield you the item that you’re looking for. The STL file (STereoLithography) is the standard file format that you will use to print your 3D model into a physical object. The file can be generated using most CAD programs so if you are building your own 3D models, chances are the software you are using can output one. Basically inside an STL file is the information needed to produce a 3D model. The model itself is broken down to a series of triangles and a list of their XYZ coordinates is used by the printer to create the physical object, layer by layer. Once you have an STL file of the model you want to print, you will have to put them through a slicing software. What slicing does is that it “tells” your printer how to print your model. It provides instructions on the number of layers needed, the starting position of the printer and the parts of the model that should be solid or hollow. There are a number of software to help you with this although some software come with the printer. 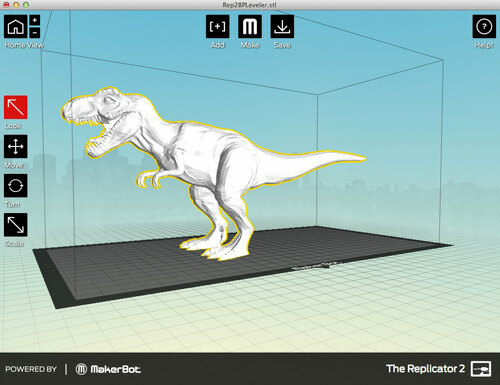 A good example would be MakerBot’s MakerWare. The great thing about a new tech trend is that there is almost always an online community devoted to it. It is no different with 3D printers. Check online for a community of people who own a particular brand, to get more insight and answers to questions you may have about the ins and outs of that printer. If the community is small or worse, nonexistent, the lack of users should raise a red flag about that particular brand. All you need to make a sound investment is to read up more about that brand and its competitors so you know what you are getting into.